Morm MaSattya is the pastor of New Life Church in Kratie province in Cambodia. The church that supports Morm is facing financial problems with sending missionaries. Because he’s no longer receiving much support, his family is facing difficulties to survive. He’s had to resort to fishing and his wife to selling baked goods. He has raised pigs, ducks, and chickens before, but he’s had little success because he hadn’t been trained. This project gave me a second hope. 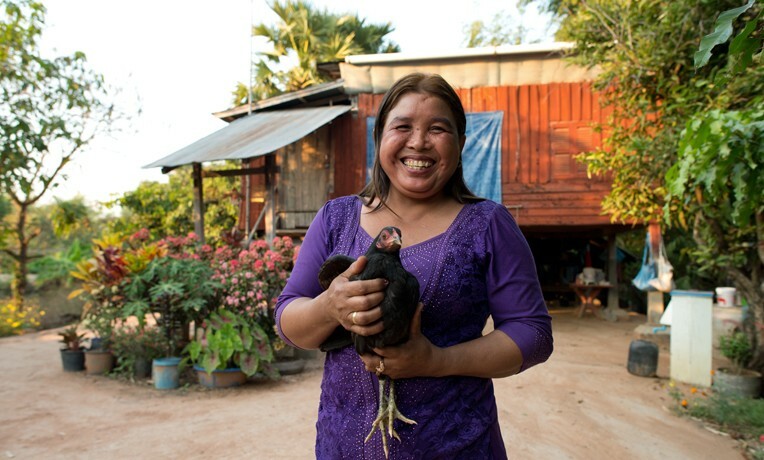 It has provided me with chicken training techniques and knowledge to start raising chickens so that my family can receive more income and food. I used to raise pigs, ducks, and chickens based on how others in my culture do it, but they got diseased and we lost a lot. After the training, I saw that my chickens were surviving and growing fast. They looked healthy despite the fact that there was a big outbreak of bird cholera in my village. I will share with people around me what I’ve learned from this project. Many things have improved, including collaboration, and many people have now heard the Good News. Since the training, I’ve started teaching my church members how to raise chickens so that they can improve their own lives. In addition to helping me, Samaritan’s Purse has provided my church with songbooks, Bibles, storybooks, and a guitar. The staff members have played an important role in my church and helped me connect with local authorities and other pastors in my province. Although the Bible says that God is with us, I often felt alone before meeting Samaritan’s Purse. But through the project, my spiritual warfare is beginning to improve. I know that Samaritan’s Purse is praying for me and that other churches are working with me.